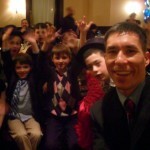 I recently performed for Liam’s Bar Mitzvah at Maggiano’s Restaurant in downtown Bellevue. His mom, Mindy, wanted a magician (Liam loves magic), but was adamant from the start that, I must not “dress up like a clown and do kiddie tricks.” That’s very wise, because teenagers should be treated more like adults than kids. I shared several recommendations from other Bar Mitzvahs that I’ve performed for in the past. One family on Mercer Island has had me perform for all three of their boys’ Bar Mitzvahs! It’s an honor to become part of a family tradition like this. I also gave her two references from recent shows. She called and spoke with both, heard what she wanted to hear, and hired me. Suggestion: when in doubt, ask to speak to a client. Any professional will be happy to have you talk to a recent client. If they balk or can’t come up with any names and numbers, move on. Be sure that the person you talk with hosted an event similar to yours (demographics, number of guests, etc.). 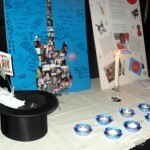 Liam loves magic, so magic was the theme for the special celebration. Close-up magic is always a crowd-pleaser for Bar Mitzvahs. 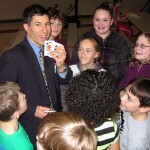 Jeff’s magic is interactive, amazing, and backed by his 100% Satisfaction Money-Back Guarantee. I was impressed with how Liam’s maturity. He narrated a wonderful slide show that featured pictures of him and many of his guests – both family and friends – that joined him that evening to celebrate the occasion. He recognized his aunts and uncles and grandparents and out of town guests. When I took the front all of the kids quickly found a seat,quieted down, and were ready for showtime. I’ve been to some wild Bar Mitzvahs, so this was a very pleasant experience! For more info on planning your son’s or daughter’s celebration in the greater western Washington area call me toll-free (877) 412-5064 or send e-mail to jeff@amazementproductions.com. This entry was posted in Uncategorized and tagged bar mitzvah, bat mitzvah, Bellevue, magic, magician, Mercer Island, mitzvah, Seattle. Bookmark the permalink.